I am a children’s book author and illustrator based near York in North Yorkshire. Despite doing an HNC in Illustration in Bournemouth nearly 20 years ago I didn’t do anything more with illustration for many years. I did however spend most of my spare time painting,with a particular passion for landscpaes in acrylics. But what I loved more than anything was everything whimsical, so 3 years ago I studied children’s book illustration with the London Art College. To help me write stories to go with my illustrations I also took up a local opportunity to attend a 20 week course in creative writing for children. Both of these were to spark a love of writing stories for children and creating characters who stories I wanted to tell. In the last 3 years I have gone on to write many picture book texts and 4 middle grade fantasy adventure novels.And I haven’t stopped writing and creating characters since. Whilst I am still seeking publication for my novels and am writing my next novel, this time for adults, I have submerged myself into illustrating, not only for myself but also for commissions. I was commissioned in 2016 to do the cover artwork for a children’s historical nove, Beast on the Broch”, by F.K.Fulton. I have also illustrated a picture book for a friend who is self publishing a series of picture books, Miss Pickle a Dizzy Witch. I was lucky enough to meet a local publisher and they will publishing my first picture book, Mouse Pirate, for which I am author and illustrator, in September this year. My love of whimsy doesn’t end there. For the last 7 years I have designing and making creatures from all manner of plush materials and yarn and I am thrilled now to be able to combine all these passions in Mouse Pirate. 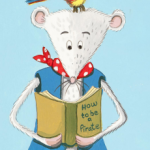 I am currently starting work on the sequel to Mouse Pirate and am enjoying the excitement of library book events with both Miss Pickle and Mouse Pirate so that I can bring their stories alive. New Book “Mouse Pirate” out now!